Aaaand… we’re back! Last week, DriveThruRPG was mostly down, so I took a week off, but I am back at it with Celebrating BAMFsies Week! The BAMFsies celebrate the “Best in Superhero Gaming” every year, and I’ve been honored to have been a judge for them in the past. Right now, there’s a sale going on that gives folks 25% off of superhero products, so I’m dedicating this week to showcasing some of the newest of those products. The first punch in this superhero brawl is thrown by Fainting Goat Games, who do a lot of supers stuff for all kinds of systems. 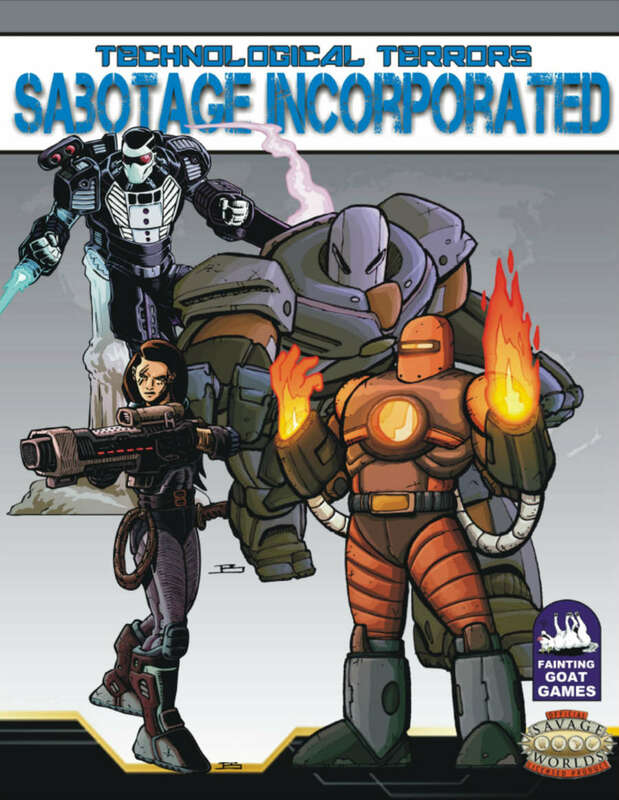 Technological Terrors: Sabotage Incorporated is a set of techno-villains designed specifically for your Savage Worlds supers game. Sabotage Incorporated is gang of super-science criminals who have risen from the meta-crime underworld and become the scourge of legitimate researchers and scientists. Technological Terrors: Sabotage Incorporated is a collection of villains with super-science and technological backgrounds. These five villains can serve as enemies or rivals for any group of heroes – whether they are technologically inclined or not. Includes a handful of adventure hooks and an accompanying map.